Prestigious technology innovation organisation the Centre for Process Innovation (CPI) has retained independent waste management group CSG on a three-year contract to manage hazardous waste arisings from its three sites across the North East. CSG will remove, transport and treat hazardous chemical and effluent waste collected from CPI’s headquarters site at the Wilton Centre, Redcar, and from sites at Sedgefield and Darlington. CPI was established to support the UK process manufacturing industry and collaborates with universities, SMEs and large corporate companies to help overcome innovation challenges and develop advanced new products. It has established national centres in printable electronics, industrial biotechnology, anaerobic digestion and biopharmaceuticals and is working with world-leading companies in utilising waste streams for the production of chemicals and low-carbon alternatives to current energy production. 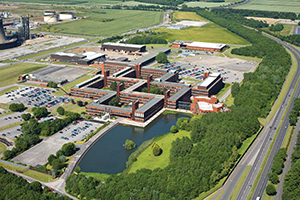 CSG, which has its national headquarters in Fareham, operates a number of waste treatment plants in the Teesside area. They include a seven-acre site on the Wilton International industrial complex where an aerobic effluent treatment plant can process a wide range of organic hazardous and non-hazardous wastes using the Eco-bio process and is designed to process effluent waste which would not be suitable for direct disposal to sewer. CPI waste will be treated at the Wilton site as well as at CSG’s Middlesbrough facility which has been undergoing a £900,000 upgrade in infrastructure and processing technology. Picture shows CPI Head Office at Wilton.